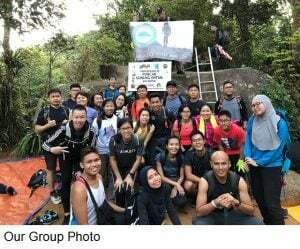 My Sunrise Hike at Mount Datuk [22 March 2019] | JustRunLah! 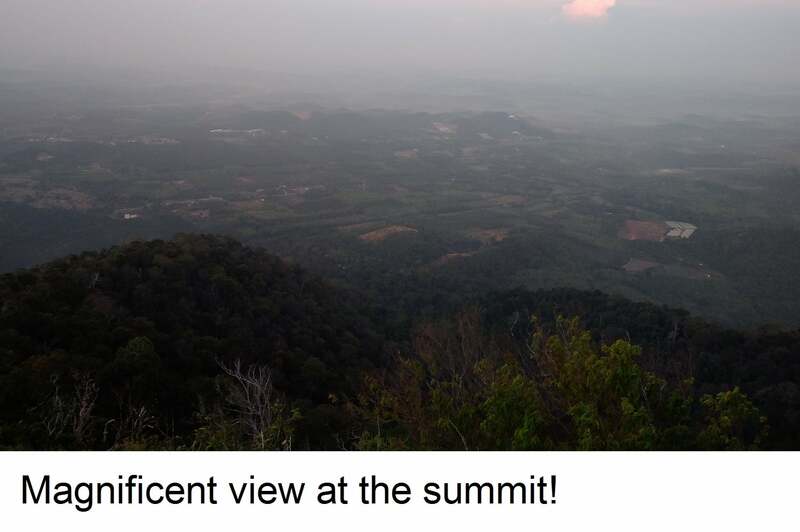 Mount Datuk is located in Rembau, Negeri Sembilan, Malaysia. Standing at around 880 m, it offers hikers a magnificent view of sunrise and a 360-degree panorama view of the surrounding scenery. However, this hike is considered ‘moderately challenging’ and is not recommended for the beginners unless you have strong physical and stamina. I had originally planned to visit Mount Kinabalu this month but the trip was cancelled because no more slot was available. Coincidentally, SGTrek had a schedule for Datuk this month. Hence, I decided to bring forward my plan to hike Datuk instead. Datuk was on my to-hike list primarily because it offers a splendid view at the summit. 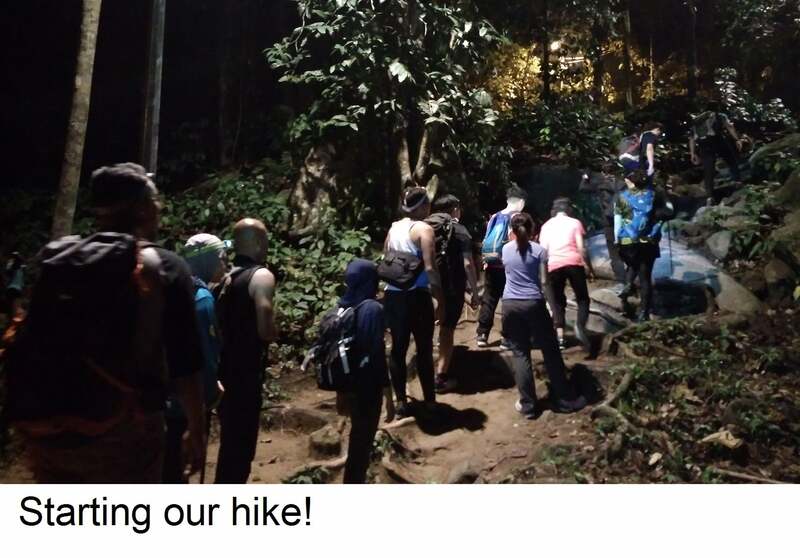 In addition, I believe I had the stamina to hike Datuk because I had hiked Mount Ophir, which is technically more difficult. 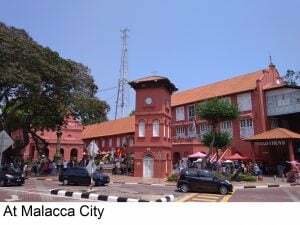 Secondly, the Datuk expedition usually includes a visit to Malacca after the hike. This means you get to hike and visit a World Heritage Site in a single trip! There were around 30 participants for this event. We met up at Marsiling MRT at 10.30 pm. Attendance was taken and we began our journey once everyone arrived. It was a Friday night but there was literally no jam at the woodlands and JB checkpoints. Clearing the customs were pretty quick. We reached Yong Peng Rest Stop after an hour. 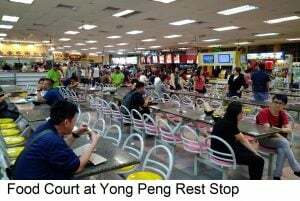 This is a common stopover for people travelling in coaches between Singapore and Malaysia. It has prayer rooms, a mini-mart selling native snacks and a food court, where travellers can buy food and drinks. I bought a loaf of bread, intending to have it as breakfast at the summit of Mount Datuk. We resumed our journey after 45 mins break. I tried to get some rest in the coach, knowing that I will soon begin my hike. Before long, we reached the external premise of the park. The road leading in was too narrow for coaches. Hence, we prepared what we needed and alighted from the coach to begin a 15 mins walk to the park. It was only 3.45 am in the wee hours of morning. The main roads were deserted and there were few street lamps. In the darkness, I can see the imposing silhouette of Mount Datuk in the far distance. The short walk to the park was a gentle up-slope. I switched on my headlamp as the way forward was too dark. 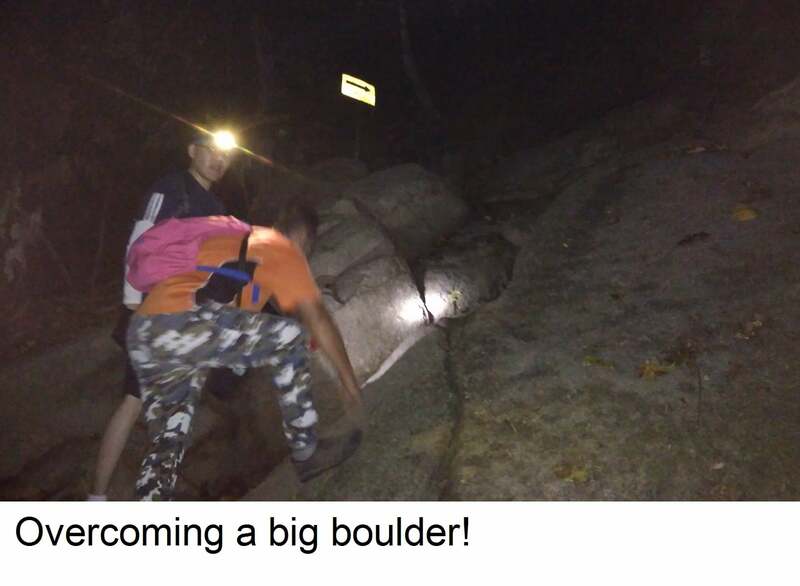 Headlamps were mandatory for this hike. There are basic facilities at the park, such as car parking lots, washrooms and drink stalls (not yet opened). I did a light wash up to refresh myself. 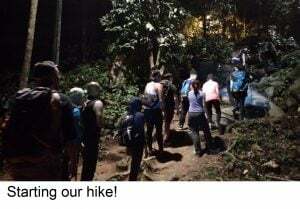 There were 3 guides from SGTrek leading the group – the leader at the front, an assistant with the group and a sweeper at the last to ensure everyone was accounted for. After a short debrief, we commenced our hike. This was my first time entering a jungle in near total darkness. It was extremely surreal and everyone felt a sense of adventure. Not too long into the trails, we were greeted by steep slopes of rocks and overgrown roots. It wasn’t easy to overcome them as we find ways to negotiate past them. This was certainly very different from Ophir, where the start of the trail was more gradual and forgiving. The headlamp was really a lifesaver. It illuminated the way and kept my hands free to grab hold of ropes (in fact, anything!) where necessary. 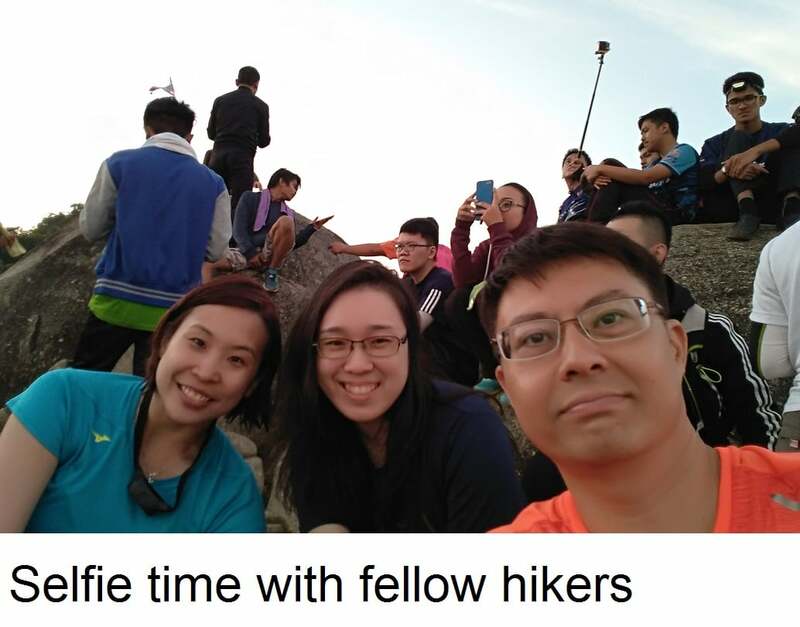 The nature of hiking, just like running, is that each individual will have different stamina and pace. Hence, the group will tend to break up at some point even though we started out together. I slowed down my pace and decided to stay together with 2 fellow hikers when I noticed them looking very tired. It is always more satisfying when we can assist in any way possible, to reach the summit or complete a race. It took us more than an hour before we left behind the sea of ‘rocks and roots’. The remaining ascent was more manageable even though there were still some pockets of big rocks to overcome. But the worse had passed. 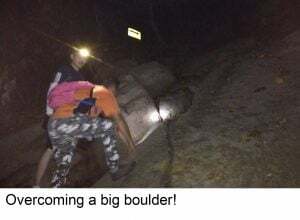 It was with great relief when the famous Datuk boulders came into sight. It was a sign that we had arrived near the summit. We came to an open space where there were already many hikers arrived before us. They were taking rest and waiting for dawn to break. Some were resting on the mats they brought along. It was around 6.15 am. We had to climb some ladders to reach the ‘true’ summit, which is formed by boulders where Mount Datuk is famous for. There is flat ground here where hikers can rest and enjoy the views. I selected a place further down near to the edge of the cliff, as the choice (safe also) spots had already been occupied. Dawn was breaking and everyone was waiting for the sun to rise. I ate the bread I bought earlier at Yong Peng, at the same time closing my eyes to immerse in the serenity of nature. 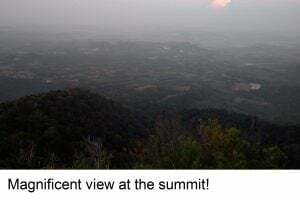 At this altitude, I could hear the chirping of birds when they awoke from their slumber in the jungles right below me. Everyone was excited when the sun started to rise. Handphones and cameras were snapping away countless pictures of the magnificent scenery. Some even put themselves at risk by standing relatively close to the edge to get the perfect Instagram shot! As the summit was getting crowded with the arrival of new hikers, I decided to make my descent back to the open space below. The rest of my group joined me shortly and together we took a group photo. We commenced our descent from the summit at 7.45 am. Unlike Ophir, the ascending and descending route for Datuk is the same. I do not like descent, as it is more taxing on the knees and there are risks of slips and falls. This is especially so for Datuk, where I need to re-negotiate the roots and rocks. In fact, I slipped 3 times on the way down. And even though it was the same route, I couldn’t quite recognize it because I had ascended in the dark. It was getting warm in the jungle as the morning wore on. The heat caused me to perspire profusely and drained my energy. I seriously felt even running a half marathon wasn’t this tired. I had used a trekking pole specifically for this hike. This pole proved useful in giving me the support I needed when I ascended the mountain and helping to stop my momentum when I descended too fast. At long last, I reached the entrance of the trail at 9.20 am. I rested for a while before strolling back to the main road for the coach. 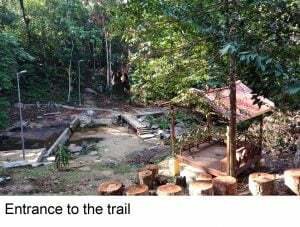 Once the last person was back, we departed from Mount Datuk to head for a good clean up. We reached Malacca at 1.30 pm and was given 2 hours to tour the place. Malacca City was listed as a UNESCO World Heritage Site in the Year 2008. Not only is it rich in history, but it is also well known for its food and numerous tourist attractions. Hungry from the earlier hike, I immediately went for lunch at Jonker Walk, tucking in the unique chicken rice (balls). There are many shops here selling souvenirs, crafts, local products and various specialities. There is even a temple for the faithful to pray. As far as I remember, Jonker Walk is closed to traffic once night falls during the weekends. The whole place comes alive with hype and activities, with hawkers selling tasty treats and keepsakes from their mobile carts and makeshift stalls. But right now, the weather was extremely hot. Everyone was trying to find and confine to shelters. I bought some local snacks from the famous ‘San Shu Gong’ to share with my family and friends back in Singapore. 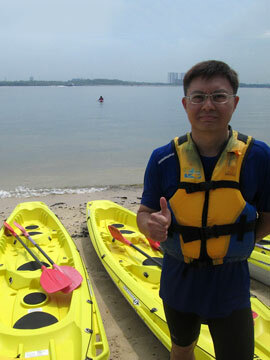 I didn’t dare linger under the sweltering heat and proceed to the rendezvous place near the Melaka Maritime Museum. We departed from Malacca at 3.40 pm, glad that we had the opportunity to visit this historical city. On the way back, we stopped at YOYO Native Food Product at Yong Peng for a while. YOYO offers a wide variety of products such as biscuits, snacks, seasonings and beverages. Some of the hikers settled down for some snacks and drinks in the ‘coffee corner’. Personally, I thought this arrangement was a nice change from the usual stopover at Yong Peng Rest Stop. We resumed our journey after 45 mins. There was no jam along the highway and customs and we arrived back in Singapore at 8.30 pm. 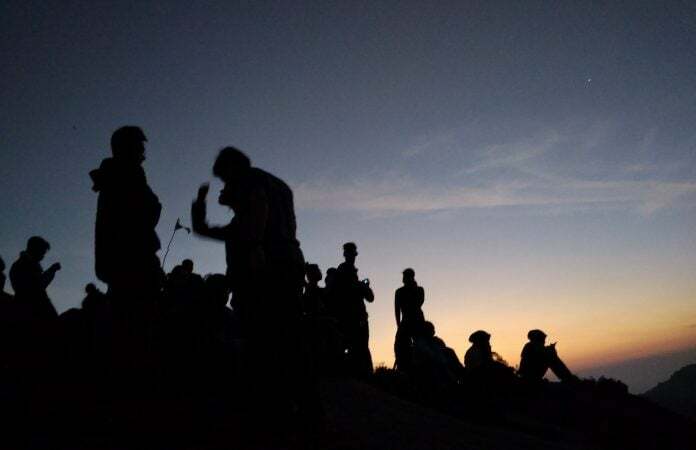 This is a very good hike which offers the unique experience of hiking in surrounding darkness with the reward of a magnificent sunrise and scenery at the summit. However, do not expect a ‘stroll in the park’ and be prepared to be physically taxing. If you are looking for a hike with sunrise at an altitude of over 500 m, I would strongly recommend you to try Mount Datuk.